In a Nutshell: Person-to-person (P2P) marketplaces are popular with consumers who want to buy, sell, and trade used goods online. But buyer and seller transaction histories and reputations don’t transfer from platform to platform. That’s why, in 2017, Listia introduced Ink Protocol, a blockchain-powered reputation storage and payment system. And it built on that technology to create Replin, an app that allows P2P marketplace users to store their data in a decentralized environment and take their reputation with them to any platform. In 1995, eBay entered the world of ecommerce as one of the first person-to-person (P2P) marketplaces. Since then, the web has exploded with a host of similar P2P platforms that give consumers the freedom to buy, sell, and trade new and used goods directly with other consumers. In the absence of trusted brands and business reputations, P2P marketplace users must rely on user profiles, verified payment methods, and feedback to build confidence. Some marketplaces even mediate disputes or serious complaints between buyers and sellers to reach amicable resolutions. Listia developed Ink Protocol as a decentralized payment and reputation system that leverages blockchain technology. Even though these types of marketplaces offer a measure of buyer-seller security, there’s a catch. While users can post items on other platforms, their profiles — often with years of transaction history and reviews — don’t transfer. Venturing on to new marketplaces means starting the process of building trust all over again. But, with an innovation known as Ink Protocol — a decentralized, blockchain-powered reputation and payment system — P2P marketplace users can take their business anywhere while preserving and building their personal credentials. 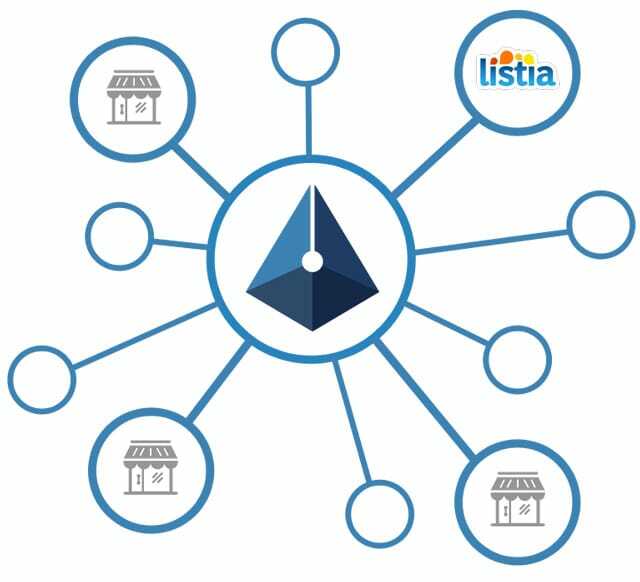 Listia, an online marketplace where consumers trade goods, introduced Ink Protocol in 2017. Since then, Listia has continued to develop Ink Protocol-powered applications such as InkPay and Replin, a reputation management app currently in beta. Designed as a comprehensive solution for both independent buyers and sellers, Ink Protocol and Replin have far-reaching implications for an increasingly diverse mobile marketplace. At the core of Ink Protocol is the Ink token (XNK), a cryptocurrency designed by Listia to trade for goods on its platform. But it handles far more than just payments. “It has features like dispute resolution, escrow, and a built-in reputation system to ensure users feel safe,” Chuang said. Ink Protocol’s design relies on what’s known as the Ink smart contract, which is stored on the Ethereum blockchain. The Ink smart contract stores a seller’s XNK tokens, along with transaction information and a “hash” that represents the feedback left by the buyer. Just like the blockchain that powers it, Ink Protocol is open-source, which means it can be used in a wide range of applications and platforms beyond Listia — including numerous ecommerce marketplaces. “The whole protocol takes what we’ve learned in Listia over the last nine years and puts it all into one system designed to be used everywhere,” Chuang said. In August 2018, Listia introduced InkPay — its first decentralized application, or DApp, based on Ink Protocol. InkPay supports XNK and two other cryptocurrencies, and allows users to buy and sell on marketplaces such as Craigslist or Facebook Marketplace — which don’t have their own payment systems built in. With each transaction, sellers gather buyer feedback, which can be displayed to build their reputation and boost sales wherever they choose to do business. Since InkPay deals solely in cryptocurrency, it’s an ideal fit for those who are already adept at using smart contracts, digital wallets, and private keys. “Sometimes, it’s hard for non-crypto enthusiasts to wrap their heads around, but it’s available and it works. And it will be ready as consumers catch up to this technology,” Chuang said. 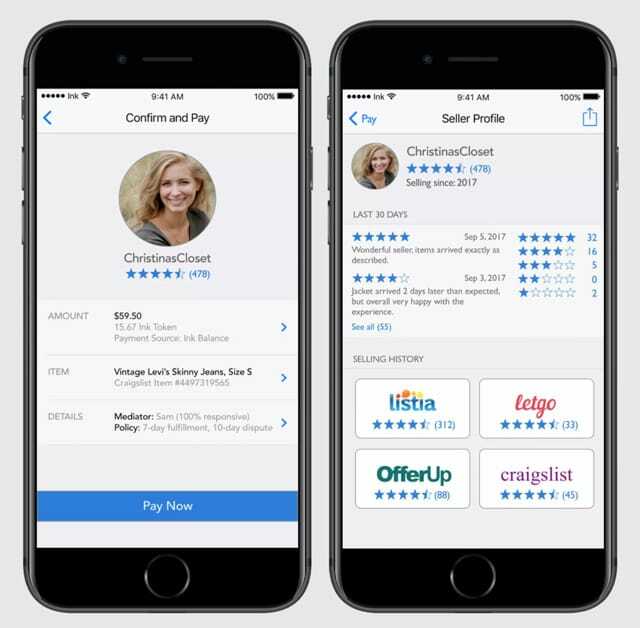 In early March 2019, Listia launched the beta version of its mainstream consumer reputation app Replin, which integrates Ink Protocol’s reputation and feedback mobility. Replin allows users to take their reputations with them across P2P marketplace platforms, including Listia. As its name suggests, Replin is all about reputation. Since it stores transaction and feedback data, users can start earning and showing off their reputation across multiple marketplaces via an easy-to-post link. Since Listia currently stores its user history via Ink Protocol, users who download Replin can immediately export their Listia feedback — as far back as its founding in 2009. Soon, the marketplace will allow users to take any new reputation they earn using Replin on other platforms and display it on Listia, as well. After its full release, Replin will be available in web, mobile web, iOS, and Android versions. And, while InkPay and Replin remain separate for now, Listia envisions the day when the growing cryptocurrency ecosystem enables them to join forces. “Long-term, we think they’ll merge,” Chuang said. With trusted seller reputation systems and the freedom to set your own prices, P2P marketplaces remain popular places to buy, sell, and trade used goods online. But they are still middlemen who keep seller reputations locked into one platform. Today’s mobile-first consumers want the flexibility to take their business anywhere, without sacrificing peace of mind or their hard-earned reputations. With Replin, consumers will have an efficient way to accomplish that. Ink Protocol, built into consumer-facing apps InkPay and Replin, looks to the decentralized marketplace of the future with options that allow users at every stage of crypto-awareness to embrace the freedom of a mobile reputation and payment system.